Flat slate coping stones are the ideal way to protect a wall as well as giving it a appealing appearance this particular wall capping is produced from the finest Brazilian slate and we are able to cut to many sizes depending on your own requirements. Available in 20mm and 30mm thickness with a very smooth natural spit top surface, they come with sawn sides but we can also make them with a 5mm chamfer or a 10mm bull nose which will give softer looking edges our most popular one is straight sawn this helps to keep the costs down. 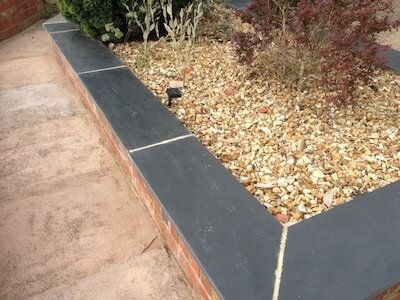 Slate has been used for many centuries as it is strong hardwearing product and unlike a cement based coping stone should last for many more years in to the future with little or no maintenance.